Outdoor hot tubs are most commonly found in residential applications, this is probably because of the ease of installing and fitting a hot tub after the house has been built. It could also be partly due to the natural ambience that can found with the synergy of nature and a hot tub, especially a wooden hot tub. Outdoor hot tubs are the choice of most home owners when buying a hot tub. There are many reasons one may choose outdoor tubs versus indoor tubs. And perhaps the most common is installation costs. An outdoor hot tub needs only a solid surface to be place on such as a concrete slab or a patio blocks. Some hot tubs can be placed on top of a deck; however, one should consult a carpenter or engineer to ensure the deck can withstand the weight. Once located in place the next step is to source power to the unit. In the case of a Northern Light Cedar Hot Tub, customers have the choice of wood fired, electric, gas, solar or heat pumps for spas, as options for heating. This flexibility is another reason most customers choose to install a hot tub outdoors. It is difficult to run gas chimney indoors for application such as a gas heater or wood fired hot tub stove. When considering an outdoor hot tub versus indoor one needs to look at the distance from the house and natural shelters for privacy and wind blocks. Most customer tend to want quick access back and forth to the hot tub especially if using it in winter. Cold brisk wind can also be a negative when enjoying an outdoor hot tub. Electrical considerations! When installing a hot tub outside the installation costs are generally higher. As an example, and outdoor hot tub will need Teck underground armored cable to ensure it is completely water tight and impervious to rodents that can chew through it. Gas lines outdoor cost more money as well electrical disconnects required by code need to be in more expensive weather proof housings. We have all experienced the effects of indoor hot tubs in hotels and vacation resorts. The indoor hot tub can fill the room with heavy chlorine odors that can be harsh on the eyes. To avoid this an indoor hot tub needs to be well vented to avoid chemical smells. Besides the odors an indoor hot tub needs much more ventilation compared to an outdoor. If not properly vented the indoor tub’s moisture will rot and mildew to quickly form inside the house. Getting a tub in an out of a house is perhaps the biggest challenge. All tubs will have an end of life and if the tub was installed during the original construction, removing it may be a large task. Installing an indoor hot tub after a build may be impossible depending on door openings, stairs, ceiling highs and corners. So, before you run out to purchase a tub for that perfect basement location make sure you do your measurements. Leaks- While most hot tubs don’t leak, Never Say Never! A hot tub piping gets old and brittle after many years. Especially if you are using lots of chlorine or bromine. Eventually the glue used when new will be subject to weaknesses and a leak can happen. Proper drainage in an indoor hot tub is a must. The drain should have a natural slope and be checked regularly. Both indoor and outdoor hot tubs require regular maintenance, an indoor hot tub will certainly be the winner if you don’t like to do any extra work. Covers get naturally dusty and rain, snow and sun will reduce their life expectancy. Leaves, grass and bugs are all part an outdoor hot tubs life! 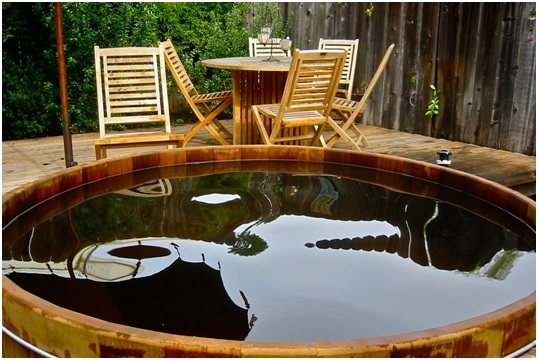 Exterior of a hot tub may need to be stained every couple years to keep the rich wood color gleaming. However, if asked most people would say the extra bit of work is certainly worth the time to be able to enjoy the peace and harmony of soaking with in an outdoor hot tub with mother nature surrounding you.